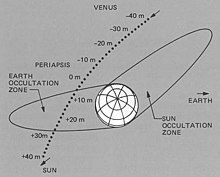 Plot of Mariner 10 flyby of planet Venus in February 1974. A planetary flyby is the act of sending a space probe past a planet or a dwarf planet close enough to record scientific data. This is a subset of the overall concept of a flyby in spaceflight. Flybys commonly use gravity assists to "slingshot" a space probe on its journey to its primary objective, but may themselves be used as primary means. The first flyby of another planet with a functioning spacecraft took place on December 14, 1962, when Mariner 2 zoomed by the planet Venus. New Horizons performed flyby maneuvers of Jupiter, Pluto and its moons in the 21st century. This type of maneuver allowed it to reach Pluto at high velocity without the complications of slowing down, after which it proceeded into the Kuiper belt on a solar system escape trajectory. ^ The International Astronomical Union classifies Charon as a moon. See Charon (moon)#Classification for details. ^ "Flyby | Define Flyby at Dictionary.com". Retrieved 2015-07-15. ^ "First Planetary Flyby Occurred 50 Years Ago Today". Retrieved 2015-07-15. ^ Talbert, Tricia (2015-03-25). "New Horizons: The First Mission to the Pluto System and the Kuiper Belt". NASA. Retrieved 2018-10-20. ^ "Spacecraft Galileo: To Jupiter and Its Moons". Space.com. Retrieved 2018-10-20. ^ "Venera 1". nssdc.gsfc.nasa.gov. Retrieved 2015-12-23. ^ "Mariner 2". nssdc.gsfc.nasa.gov. Retrieved 2015-12-23. ^ "Mars 1". nssdc.gsfc.nasa.gov. Retrieved 2015-12-23. ^ "Zond 1". nssdc.gsfc.nasa.gov. Retrieved 2015-12-23. ^ "Mariner 4". nssdc.gsfc.nasa.gov. Retrieved 2015-12-23. ^ "Zond 2". nssdc.gsfc.nasa.gov. Retrieved 2015-12-23. ^ "Venera 2". nssdc.gsfc.nasa.gov. Retrieved 2015-12-23. ^ "Mariner 5". nssdc.gsfc.nasa.gov. Retrieved 2015-12-23. ^ "Mariner 6". nssdc.gsfc.nasa.gov. Retrieved 2015-12-23. ^ "Mariner 7". nssdc.gsfc.nasa.gov. Retrieved 2015-12-23. ^ "Pioneer 10". nssdc.gsfc.nasa.gov. Retrieved 2015-12-23. ^ a b c d "Mariner 10". nssdc.gsfc.nasa.gov. Retrieved 2015-12-23. ^ "Mars 4". nssdc.gsfc.nasa.gov. Retrieved 2015-12-23. ^ "Mars 7". nssdc.gsfc.nasa.gov. Retrieved 2015-12-23. ^ "Mars 6". nssdc.gsfc.nasa.gov. Retrieved 2015-12-23. ^ a b "Pioneer 11". nssdc.gsfc.nasa.gov. Retrieved 2015-12-23. ^ "Venera 12". nssdc.gsfc.nasa.gov. Retrieved 2015-12-23. ^ "Venera 11". nssdc.gsfc.nasa.gov. Retrieved 2015-12-23. ^ a b "Voyager 1". nssdc.gsfc.nasa.gov. Retrieved 2015-12-23. ^ a b c d "Voyager 2". nssdc.gsfc.nasa.gov. Retrieved 2015-12-23. ^ "Venera 13". nssdc.gsfc.nasa.gov. Retrieved 2015-12-23. ^ "Venera 14". nssdc.gsfc.nasa.gov. Retrieved 2015-12-23. ^ "Vega 1". nssdc.gsfc.nasa.gov. Retrieved 2015-12-23. ^ "Vega 2". nssdc.gsfc.nasa.gov. Retrieved 2015-12-23. ^ a b c "Galileo - In Depth | Missions - NASA Solar System Exploration". NASA Solar System Exploration. Retrieved 2015-12-23. ^ "Giotto". nssdc.gsfc.nasa.gov. Retrieved 2015-12-23. ^ "Sakigake". nssdc.gsfc.nasa.gov. Retrieved 2015-12-23. ^ "Ulysses - In Depth | Missions - NASA Solar System Exploration". NASA Solar System Exploration. Retrieved 2015-12-23. ^ "Mars Observer". nssdc.gsfc.nasa.gov. Retrieved 2015-12-23. ^ "NEAR Shoemaker". nssdc.gsfc.nasa.gov. Retrieved 2015-12-23. ^ "Cassini Completes First Venus Flyby". Cassini Solstice Mission. Retrieved 2015-12-23. ^ "Cassini Completes Second Venus Flyby". Cassini Solstice Mission. Retrieved 2015-12-23. ^ "Cassini Completes Earth Flyby". Cassini Solstice Mission. Retrieved 2015-12-23. ^ "Press release: Cassini Celebrates 10 Years Since Jupiter Encounter". NASA. December 29, 2010. ^ a b c "Stardust/NExT". nssdc.gsfc.nasa.gov. Retrieved 2015-12-23. ^ a b c "Nozomi". nssdc.gsfc.nasa.gov. Retrieved 2015-12-23. ^ "Hayabusa". nssdc.gsfc.nasa.gov. Retrieved 2015-12-23. ^ a b c d "Rosetta". nssdc.gsfc.nasa.gov. Retrieved 2015-12-23. ^ a b c d e f "MESSENGER". nssdc.gsfc.nasa.gov. Retrieved 2015-12-23. ^ a b c "Deep Impact/EPOXI". nssdc.gsfc.nasa.gov. Retrieved 2015-12-23. ^ "Dawn". nssdc.gsfc.nasa.gov. Retrieved 2015-12-23. ^ a b "NASA - EPOXI Mission - Mission". epoxi.umd.edu. Archived from the original on 2009-12-14. Retrieved 2015-12-23. ^ "Akatsuki". nssdc.gsfc.nasa.gov. Retrieved 2015-12-23. ^ "IKAROS". nssdc.gsfc.nasa.gov. Retrieved 2016-01-05. ^ "Juno". nssdc.gsfc.nasa.gov. Retrieved 2015-12-23. ^ "New Horizons Pluto Kuiper Belt Flyby". nssdc.gsfc.nasa.gov. Retrieved 2015-12-23. ^ "Hayabusa 2". nssdc.gsfc.nasa.gov. Retrieved 2015-12-23. This page was last edited on 15 January 2019, at 07:50 (UTC).